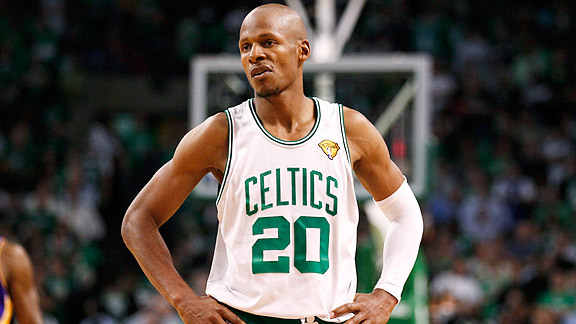 SOURCE– Ray Allen is seriously considering an NBA comeback and has spoken recently to the Boston Celtics and Milwaukee Bucks about possibly joining them for the 2016-17 season, he told the Hartford Courant. “I would love going back to those places if it worked out,” Allen, 41, told the newspaper at his annual basketball camp at East Granby (Connecticut) High School, “because both teams are good, too. It doesn’t necessarily have to be championship-or-bust for me to go back to the NBA. Boston already has an overstocked roster with 18 players under contract for next season. The Celtics do have a need for shooting and could benefit from a veteran presence given that summer signees Al Horford andGerald Green are the oldest players on the team at 30. Well that came out of no where. I mean we heard a couple rumors that Ray Allen might be interested in coming back to play for the Golden State Warriors. Which would make sense after the last time we saw Allen was with the another NBA super team, the LeBron James’ Miami Heat. But the Celtics and the Bucks?! I would have never guessed that those were the two teams he is talking too. I really wonder how much left he has in the tank. I mean Ray has one hell of a stroke, which is something the Celtics certainly could use, but 41 is 41. I mean how is he going to be able to keep up in this league. Especially on this Celtics team who loves to move fast and who is ranked 3rd in pace. I don’t know, I mean I lean on the side of why not. He can still shoot, even if he is just a guy that comes in off the bench and drains a couple a night, or he is a guy they use late in the game that they can rely on to make a big shot.